A foramen (pl. foramina) is an opening that allows the passage of structures from one region to another. In the skull base, there are numerous foramina that transmit cranial nerves, blood vessels and other structures – these are collectively referred to as the cranial foramina. In this article, we shall look at some of the major cranial foramina, and the structures that pass through them. The foramina of the skull are most commonly considered in the context of the cranial nerves. In this section, we will discuss the foramina that transmit cranial nerves. Figure 1 – Superior view of the skull base showing the foramina and which cranial nerves pass through them. The cribriform foramina refer to numerous perforations in the cribriform plate of the ethmoid bone. They connect the anterior cranial fossa with the nasal cavity. These foramina allow the passage of axons of the olfactory nerve from the olfactory epithelium of the nose into the anterior cranial fossa where they communicate with the olfactory bulb. The optic canal permits the passage of the optic nerve (CN II) and the ophthalmic artery into the bony orbit. It is bordered superiorly by the lesser wing and inferiorly by the greater wing of the sphenoid bone. Fig 2 – Foramina and bony landmarks of the sphenoid wings and pterygoid process. The foramen rotundum is located at the base of the greater wing of the sphenoid, inferior to the superior orbital fissure. It provides a connection between the middle cranial fossa and the pterygopalatine fossa. The maxillary nerve (branch of the trigeminal nerve, CN V) passes through this foramen. The foramen ovale is another opening located at the base of the greater wing of the sphenoid. It is positioned posterolaterally to the foramen rotundum within the middle cranial fossa. It conducts the mandibular nerve (branch of the trigeminal nerve, CN V) and the accessory meningeal artery. The internal acoustic meatus is a bony passage located within the petrous part of the temporal bone. 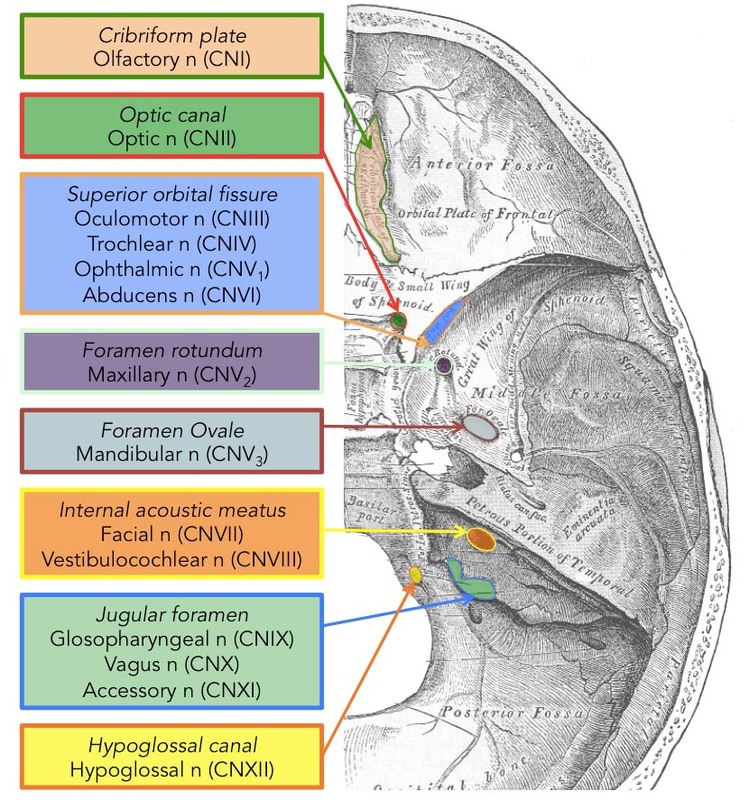 The canal connects the posterior cranial fossa and the inner ear, transporting neurovascular structures to the auditory and vestibular apparatus. The facial and vestibulocochlear nerves pass through the internal acoustic meatus, alongside the vestibular ganglion and labyrinthine artery. The jugular foramen is formed anteriorly by the petrous part of the temporal bone and posteriorly by the occipital bone. Anterior – contains the inferior petrosal sinus (a dural venous sinus). Middle – transmits the glossopharyngeal nerve, vagus nerve and cranial part of the accessory nerve. Posterior – contains the sigmoid sinus, and transmits meningeal branches of occipital and ascending pharyngeal arteries. Fig 3 – The bony landmarks and foramina of the posterior cranial fossa. The hypoglossal canal is located in the occipital bone, through which the hypoglossal nerve (CN XII) passes to exit the posterior cranial fossa. 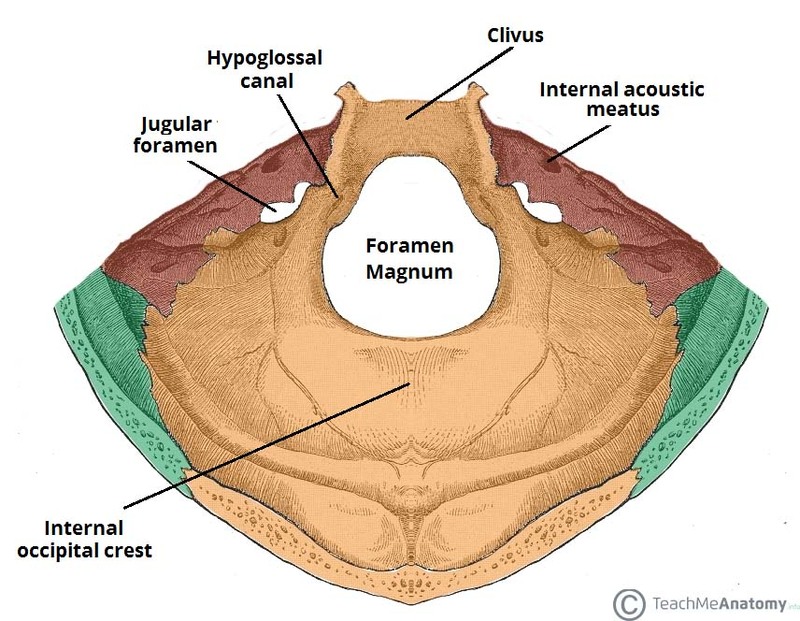 The foramen magnum is the largest of the cranial foramina. 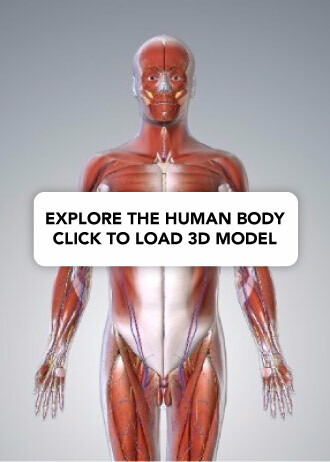 It lies in the occipital bone within the posterior cranial fossa, and allows the passage of the medulla and meninges, the vertebral arteries, the anterior and posterior spinal arteries and the dural veins. The spinal division of the accessory nerve ascends through the foramen magnum to join the cranial division. Once combined, the completed nerve exits through the jugular foramen as described above. The foramen spinosum is located within the middle cranial fossa, laterally to the foramen ovale. It allows the passage of the middle meningeal artery, the middle meningeal vein and the meningeal branch of CN V3. Which bone of the skull contains the optic canal? Which structure passes through foramen rotundum? Which of the following structures is NOT conducted by foramen spinosum?